Having thoroughly decompressed from our Eye of the Storm conference at Tate in my own way, I proceeded to Huddersfield, and thence by swinging careering coach drive across the Pennines to Castleton for the marvelous Biorama 2, a media art event in a cavern, organised by the University of Huddersfield (Derek Hales) and artist Andy Gracie. 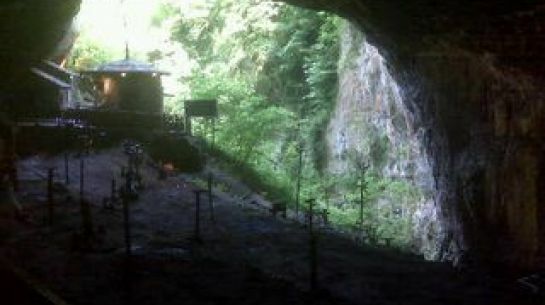 Biorama 2 took place in the vast Peak Cavern, the entrance to a 30 km cave system. The event explored the biology of the underground through the notion of ‘umwelt’ through a series of talks, discussions, workshops and expeditions into the cave system. I couldn’t make the workshops which took place in Huddersfield on the Wednesday and Friday, but I joined the group for the outing to Peak Cavern and a terrific day of presentations, performance and cave exploration. The meeting took place inside the cave, an AV system set up in this most unlikely setting. The speakers were artists Oron Catts, Agnes Meyer-Brandis,Antony Hall and Andy Gracie, curator Ulla Taipale, and microbiologist Paul Humphreys who started the day with a fascinating talk on extremophile bacteria. Andy Gracie gave the rundown on some historical theories about the structure of the Earth, as well as Admiral Byrd’s speculated 1947 discovery of the entrance at the north poles into the hollow earth. He also explained Jakob von Uexkull‘s theory of ‘umwelt’, an organism’s perception of its environment, and its influence on the development of biosemiotics by Thomas Sebeok. Agnes Meyer Brandis introduced some of her recent work. Agnes inhabits a world of enchantment, weaving tales of magic and myth from her journeys and explorations. In her Moon Goose Experiment (2008), Agnes traveled to Siberia for a total solar eclipse to recreate Francis Goodwin’s story of a man who flies to the moon attached to a flock of moon geese. She also spoke about her glacier studies in Argentina and recent meteorite watching event in Russia. After a short trip from the chilly cave down into the village for coffee and cake and to warm our bones, Oron Catts gave a talk about SymbioticA’s latest project ‘Adaptation’, a developing programme of artist residencies and events opening up discussion around the competing interests surrounding Lake Clifton, home to the largest lake-bound thrombolite reef in the southern hemisphere. Thrombolites, or ‘living rocks’, are built by micro-organisms. The day finished with a great sound installation by Joe Gilmore in a deep cavern, echoing frequencies bouncing off the cave walls. Left to our own devices by the people who usually police the cavern most contientiously to ensure the safety of visitors, we scrambled up the cavern sides and down tunnels, in unsuitable shoes, trying to avoid the sheer drops.